The way teams collaborate has changed. Project management has evolved. So has our company. Before we built ZenHub, our team searched for the perfect project management and collaboration process. But every process we tried resulted in new queues to check, tasks to assign, and priorities to juggle. 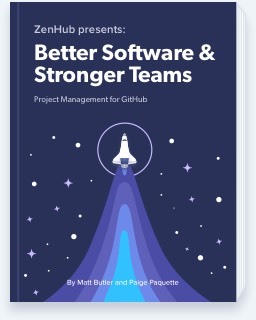 Because other solutions were third-party (read: outside GitHub, where we code, work, and live), they created friction between PMs, developers, and the rest of the team. The features we’ve prioritized for 2.0 are guided by a few central requirements that have been with us since Day 1. 1. Features should increase centralization and decrease silos within teams. They should result in greater transparency and decrease time spent context switching (from tool to tool, or from feature to feature). 2. Features should appear seamless inside GitHub’s UI. GitHub's magic is in its functional, simple interface. Workflows should never be interrupted by a new feature. 3. Features should help democratize the project management process. Today, ZenHub is still the only project management and collaboration solution presented in GitHub's UI. The new 2.0 provides more robust features, while retaining the 'get-out-of-the-way-ability' that we're so fond of. Here's what's new. The new ZenHub Boards can display issues from several repos in one place. Connecting Task Boards provides total visibility to your projects, making sprint planning and prioritization more transparent and efficient. ZenHub Boards can now be filtered by GitHub Repository in addition to Assignee, Milestone, and Label. Task Boards are ZenHub's flagship feature, displaying all tasks in one streamlined interface. In 2.0, we've minimized or eliminated any need to click around. You can now create, edit, and comment on issues directly from Task Boards, so you never have to leave them. By popular request, we've also added toggles to hide pull requests and closed issues from the Board. Burndown Charts are meant to track velocity during short sprints of work. As an early indicator of how projects are progressing, ZenHub's Burndown Charts can help teams meet deadlines and track their velocity. Because they visually display complete and incomplete work, they’re also a user-friendly reporting tool. Each of your GitHub Milestones now has its own Burndown Chart. Like every ZenHub feature, Burndown Charts integrate with GitHub activity. Each time your team closes an issue, a new data point is added to the chart. ZenHub's Burndown Charts display your project’s completed work in relation to its estimated timeline. The new "Estimate" button in issue view enables you to estimate time, or complexity, for each task in your project. Time estimates help teams gauge complexity of tasks at a glance. Issues will appear in ZenHub's Burndown Charts once they've been assigned a time estimation. When we designed our first website, ZenHub customers were mostly comprised of small, scrappy startups. Our userbase has since expanded to include industry giants across nearly every continent, including Enterprise-level teams like Facebook, NBC, Microsoft, Thomson Reuters, Sony, and many others. It was time for a sleeker, more mature design for 2.0. See it on our redesigned website (including new educational tutorials) and in subtle updates to your UI. A sincere thank-you to our customers, whose feedback informs and shapes our product. Let us know your thoughts @ZenHubHQ. Onward!